Remember the scramble to grab everything possible from Toys "R" Us before they officially closed shop? Well, here we go again. 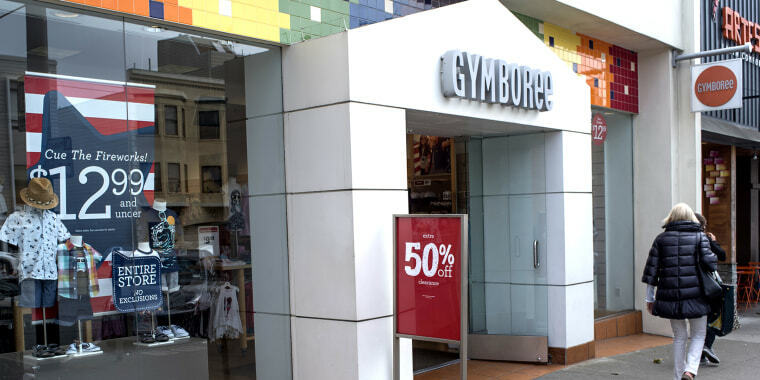 The once popular children's clothing retailer Gymboree, which at one time had a nearly cult-like following, is expected to file for bankruptcy and close its remaining brick-and-mortar stores, the Wall Street Journal first reported. The Gymboree website says it operates more than 900 retail stores in the U.S. and Canada, as well as franchises around the world. TODAY Style reached out to Gymboree for comment, but have not heard back by publish time. So what happened to this company that once saw a rush of parents and kids in their stores? It's a combination of many things. Allen Adamson, New York University adjunct professor at the Stern School of Business and author of "Shift Ahead," told TODAY Style that the retailer simply couldn't cut it in the modern retail landscape. "The tsunami hitting retail is crushing all but the strongest brands," Adamson said. "They sold average-quality kids' clothes in an average way. Today, average is over." He also pointed out that the company sold the playgroup portion of its business, which may have been a bad idea. "Gymboree used to be connected to an experience," he said, but when they separated the two businesses, what was left was not very distinctive." It didn't help that many Gymboree locations are in malls and "malls are becoming ghost towns," Adamson said, noting that busy moms are much more likely to buy online. "People still go out to get special and different," he continued. "They just won’t go out to shop to get ordinary. No one is going to schelp to the mall to do ordinary." Michael Dart, partner in the consumer goods and retail practice of A.T. Kearney, a management consulting firm, told TODAY that the company's financial situation was not set up for success. After filing for Chapter 11 bankruptcy for the first time in 2017, they were bought by lenders and carried a large debt load. That didn't seem to leave them with enough capital to invest in order to compete with stores like Children's Place, Old Navy and even Target and Walmart, according to Dart. It's possible that the company's higher-end brand, Janie and Jack, may be sold to another company, according to CNBC. So what to do if a Gymboree gift card is sitting around the house? Go out and spend it quickly, advised Dart. The company will likely try to sell off as much of its merchandise as quickly as possible (remember Toys "R" Us?) and then close within a matter of months.